But the sweat had hardly had time to cool on JV’s preened brow before me grabbing the bottles to check out what the wines had been up to all these years. The one stunner was an Oude Libertas Cinsaut 1971, the astounding quality of which was actually brought to my attention by Joaquim. Upon tasting the wine he sat back in an emotional state of Portuguese suadade, a dark melancholic mood the Latinos usually experience during moments of emotion-laden memory, forfeited romance and moving culinary reminiscence. I poured the 46 year-old Cinsaut and it lay ruby-like in the class, the dim light of Distell’s Tabernacle wine trove giving it an eerie glow. The nose was equally fresh and unfettered by all the time in the bottle, exuding diced Algerian prunes, crushed tumble-weed and shredded Havana tobacco leaf, half-cured. To the lips, and the berries were brimming, the spice was strumming and the wine was pumping. It was confidently painting the palate with deft, quick strokes of dried Turkish fig, red raisin skin, cut pastrami and a wonderful, succulent splash of iced cherry. Underneath this, a backbone of sleek, firm and taut tannins were firmly propping up the flavours with Viagra-like efficiency. I called Duimpie Bayly, former head of production at Stellenbosch Farmers Winery who made the now-defunct Oude Libertas range, for some information on the wine, and it was pretty simple. Grapes from Paarl and Northern Paarl. Fermented until dry and kept for a few months in stainless steel and some of those monstrous oak vats. As well as – interesting this – some Port pipes aka old barrels of 550 litres. Not a strip of new wood thus. 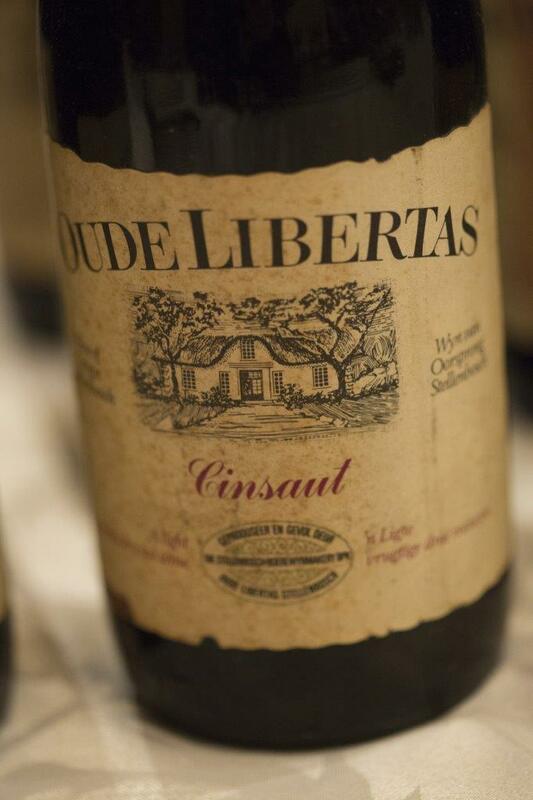 I am not a huge believer in this Cinsaut-hype currently going around as until this Oude Libertas 1971 I have never tasted wine from this variety that has come even close to any sort of greatness. But after this old timer, I know that hope does spring eternal indeed. 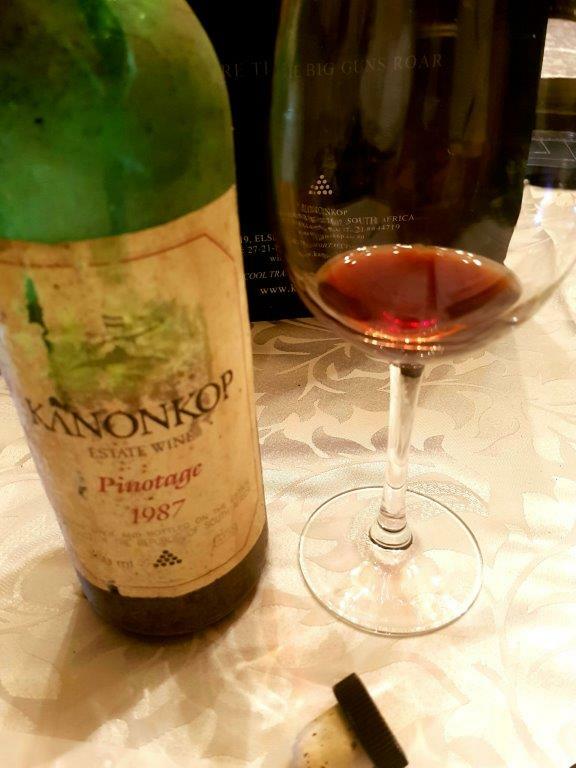 The other re-corked corker was from Kanonkop, and a 1987 Pinotage. Being Kanonkop I knew the chances of the wine surviving well were good, but was not quite prepared for this. Like the previous wine described, the colour of the 30 year-old Pinotage was clear and radiant. And when it came to the nose, it was closer to Burgundy than a bus of Japanese tourists looking for the Romanée Conti vineyard. Really, this was mature Pinot Noir bearing all the all-spice, wet-mushroom, shovelled fresh compost and riveting black fruit one expects from something found in a monk’s locker outside Nuits-Saint-Georges. Deceptively light and fleeting in its attack on the palate, the wine’s restrained entrance is followed by a whack of sensual, haunting flavours. From hung wild hare to wild strawberries; autumn mulberry to chestnut peel; cherry compote and damp Free State biltong, this wine was laying it on and creating another memorable experience I’ll never forget, from the best Pinotage ever tasted. You must be from the Joubert clan known more for their humour than vinous insight.